There are key distinctions between wills and trusts. At it’s most basic, a will requires a process called “probate” and a trust require administration. Each has it’s best use and it is my job to help you determine the optimal solution for your particular needs. A review of some of the basics will help. 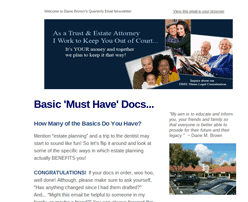 A Living Trust is document signed during the client’s lifetime. The trust names someone to manage the client’s assets during lifetime and distribute the assets after the client’s death. It is called a living trust because it is effective during lifetime. It is revocable -the client can change during lifetime. Usually the creator of the trust acts as the trustee until his or her death. Avoid probate (Court Supervised Administration) – The probate process is expensive, takes a long time, and is a public proceeding. See detailed discussion below. Financial Management During Incapacity – Once again, the failure to plan will guarantee a court process. Anyone with an ill friend or relative knows that you cannot just go to the bank and ask to take over the payment of bills. If the account is in the name of the ill person, you must have court permission to obtain the funds. This is called a conservatorship of the estate. The trust provides for management of your assets during lifetime and names someone to assume responsibility for the payment of bills and collection of income if you become disabled. This eliminates the need to go to court to arrange for the appointment of a conservator of the estate. The appointment of a conservator results in loss of rights with a finding of incapacity. This process is open to the public and so is the file. Reduce or Eliminate Estate Taxes – If the net value of assets is high enough, there is an Estate Tax at the second death. A properly drafted trust with tax provisions can reduce or eliminate that tax. Control Distribution – In some cases a married person will be reluctant to give a spouse all of the assets outright. Instead, such person may say, “let my spouse use it during spouse’s lifetime and at his or her death the remainder will go to my children”. This may be more important for people who have children from a prior marriage. 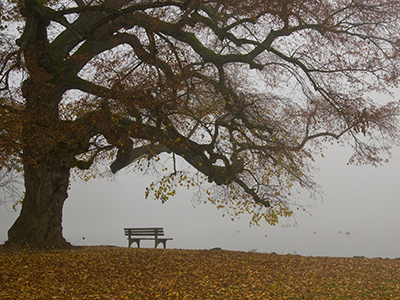 The enjoyment that the surviving spouse has in the deceased spouse’s share can be narrowly or broadly drawn, depending upon the goals of the Settlors. The executor is entitled to the same amount. For example, an estate with a gross value of $800,000 will pay $19,000 in attorney’s fees. In addition, there are various costs associated with the probate procedure, for example, court filing fee and publication of the Notice of Death, which total approximately $1,000. The Lengthy Process – The probate process also takes time – the average length is twelve months. While the probate is open the personal representative may not distribute any assets without court permission. This may cause hardship for family members who need money right away. No Privacy – Finally, anyone can read the court file. The file has a list of all assets and their values. It also contains the names and address of all relatives of the decedent and the beneficiaries of the estate. 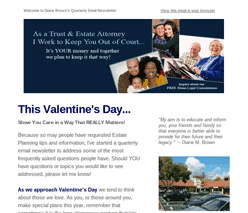 How is Trust Administration Different from Probate? Administration of a living trust is less expensive, takes less time, and is more private. Trust administration is much less expensive, although the successor trustee may need some help from an attorney. A typical trust administration will cost about one-third of what the probate will cost. Because there is no court supervision, the Trustee may distribute assets to the beneficiaries immediately. Except for required notices and information to the beneficiaries, the process is completely private. Additional appointment times may be available. Please call 408-376-2755 to inquire. 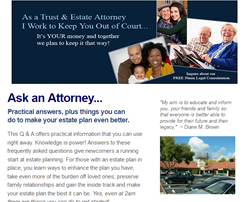 Estate planning is for everybody; especially married couples, parents, and grandparents. Planning ensures your wishes are carried out, not the whims of relatives or the courts.